When I was little, I hated beetroot. I was afraid of its vivid purpleness and I couldn't even begin to imagine what it tasted like. All I knew is that it was horrible and purple and a bit shiny. And most of all, it looked really wrong. This may or may not have been compounded by my mother's distrust and dislike of pickled beetroot. I've never eaten pickled beetroot so I can't comment on it, but the smell is pretty vile. So how did I come to change my mind? This dish, which is one of my mother's. She convinced me to try a little, persuading me that the combined flavours of beetroot and tahini were quite delicious. And she was of course, right. As usual. Trim off any remaining beetroot stalks and boil in lightly salted water for 20-25 minutes, until soft. Drain and set aside to cool. Once cool, peel the beetroot using a sharp knife. I also donned a pair of latex gloves as I didn't want to stain my hands a fetching shade of purple. Slice into 1cm slices and transfer to a plate or serving dish. Next, prepare the tahini - spoon two tablespoons of the paste into a bowl, crush in the garlic and add the lemon juice and olive oil. Beat with a spoon or fork until emulsified, then add the boiling water and beat again until thoroughly mixed. 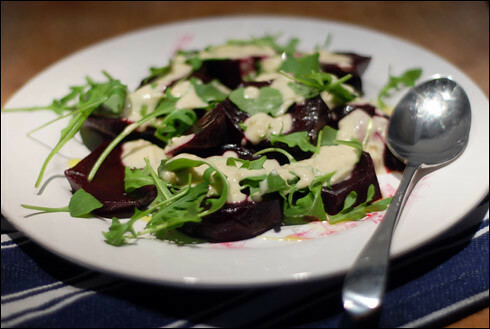 Drizzle the beetroot with a little olive oil, scatter the rocket leaves on top and then spoon the tahini sauce on top. Serve as part of a selection of salads. Perfect for hot summer days!